Benchmade produced the RUKUS line several years ago and they have been mostly discontinued. We thought they were about the toughest combat folder available. Benchmade Knives has brought back one model for a sprint run and it’s the mini RUKUS with black combo edge blade. They’ve added the Assisted mechanism to the Axis lock and so this is the most spectacular RUKUS we have ever seen- outside of the Gold Series they have offered. 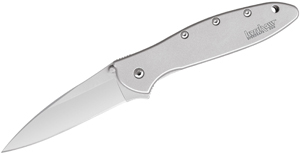 Kershaw Knives has released this “very cool” folding knife model. As far as pocketknives go, most fast openers have springs to help them fly open. Kershaw Knives has been improving their “flipper” system of opening pocketknives and this is the fastest opener we have seen. No spring is needed! The frame lock on this pocketknife is also a superbly strong locking mechanism. One side of the handle is G10 and the back is the steel frame with the one part that flexes over to lock the blade open. This is a great pocketknife! 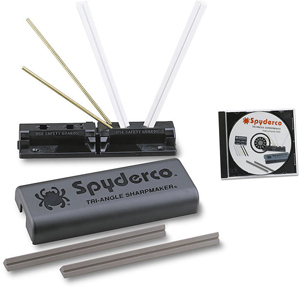 It is medium sized with a 3″ blade and is slim and seems easy to carry. 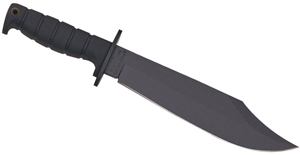 It’s well made in the USA and sells at www.knifecenter.com for less than $50! The Kershaw Shallot is a great knife. It is a large, usable size and has all the great Ken Onion assisted opening features. We now have several permutations of this model and this one has the hardest steel. The Damascus models may look prettier to some and they are a super high quality product, but this ZDP-189 steel that is on the cutting edge of these composite blades is super hard and will hold an edge a really long time. Surprisingly, it is not too difficult to resharpen them, either.